Angela Haynes joined our team in late 2014 as Development Director. Several years ago, I had the opportunity to work with a nonprofit focused on nutrition and healthy food preparation for children who were food-insecure. It was a huge awakening for me – prior to that experience I hadn’t truly realized the connection between those struggling with food insecurity, and the ability to have access to healthy, fresh food. 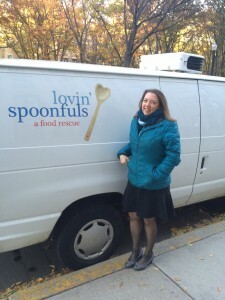 When I was introduced to Lovin’ Spoonfuls, the concept seemed like a perfect solution to an incredible problem and I knew that I wanted to help the team in whatever capacity I could. Our work is amazing, we have the ability to impact so many people’s lives, but that does not come without costs. It is my job to find and secure funding to allow us to be able to rescue more food, and impact even more food-insecure families. On an average day I am researching and writing grants, planning our fundraising events, and working with donors. I am proud because I know that everything I do is furthering our ability to make a bigger impact. What’s the strangest/most exotic food item you’ve seen out on the road? My first week on the job, I had the opportunity to haul with each of our drivers. It was truly eye-opening in the fact that I had not realized just how MUCH healthy, beautiful food would simply being going to waste if we were not picking it up and delivering it to those who need it. The most interesting piece we picked up was a Cherimoya from Trader Joe’s. I had never seen one before, but it caused me to research it post haul. It’s a great source of vitamin B6, C & dietary fiber, is eaten raw, in salsas and can be cooked in a variety of ways. I’m not a great cook, but I am learning. The items I cook best tend to be Italian dishes. My signature recipes are lasagna and homemade tomato sauce, which have been passed down for generations. People also enjoy my chili recipe, veggie mac & cheese, and lemon spinach soup. Right now my fridge is pretty empty, but the basics that I always have on hand are eggs, feta cheese, spinach, apples, cucumbers and sparkling water. Every fall we would go apple picking, and we would get one bag of apples from trees, but we would also get a bushel of “drops.” These are apples that fell off the tree, or people dropped. My mom would always say, “They are just as good as what is on the tree – why let them go to waste?” When we would get home, my Gram and aunt would be waiting for us. Together the whole family would start an apple pie assembly line, and make apple pies to give to neighbors, friends, family, and of course freeze several for the holidays. It was a time where we could catch up and cook together. After working at Loivn’ Spoonfuls , I’ve realized that my experience with a variety of foods is actually quite limited. Since I have started working here, I have been trying new foods, and enjoying it. I no longer avoid something because it looks different or I don’t know how to cook it. Now I find myself looking up recipes, and finding new ways to cook food and leftovers. This past fall I made spaghetti squash for the first time and it was delicious! My favorite spot of all time in Boston is the Charles River, but I also enjoy the Elizabeth Kennedy Greenway, the Emerald Necklace and the Public Gardens. There are so many wonderful places to eat in Boston, I can’t pick just one. There are so many people who inspire me, but my mom and grandmother are two of the strongest women I know. Both have faced incredible life challenges, head on with a smile and gratitude.